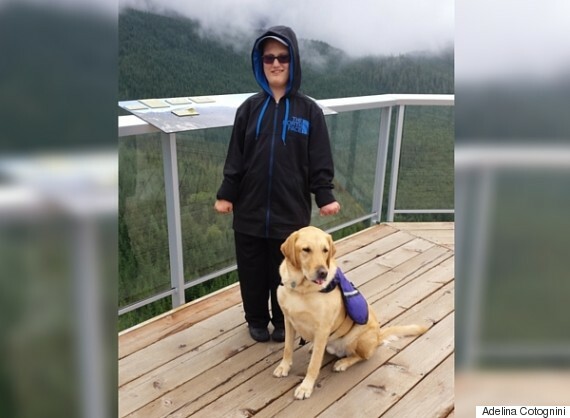 Autistic Boy With Service Dog Denied Whale-Watching Trip In B.C. "He kept saying, 'You're right, Mom. They shouldn't have refused us.'" A mother whose autistic son was denied a whale-watching tour by multiple B.C. companies, on account of his service dog, says the family plans to file a complaint with the province. Last week, Adelina Cotognini was vacationing in Vancouver, Whistler, and Victoria, B.C. with her husband and 12-year-old son Adam. The Toronto family had been looking forward to a coastal whale-watching trip. 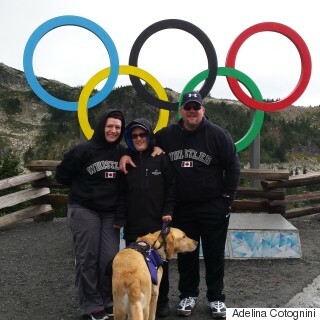 But when they called to book their tour over the weekend, three companies — Vancouver Whale Watch, Steveston Seabreeze Adventures, and Eagle Wing Whale Watching Tours — turned the family away because of Adam's service dog, Hitch. Allergy concerns for other passengers. The dog would be a liability in case of emergency. Other passengers might be afraid of dogs. Cotognini said Cedric Towers, who owns Vancouver Whale Watch, also told her that he's never taken service dogs on tours and never will "because he has an obligation to the majority of his patrons, not just one." But Towers said it's a matter of thinking about the dog's overall safety. "This is similar to white water rafting at times, and it's just not a comfortable environment — we don't take people in wheelchairs on these boats either," he told HuffPost B.C. in a phone interview Friday. "But there is a chance we could work out an arrangement, if you call ahead of time, under a few factors — like calmer weather and a shorter trip." Cotognini said her son was gutted to learn they wouldn't be seeing any whales. Adam Cotognini, 12, and his service dog, Hitch. "For him, he understands that the dog is an extension of him. We've taught him that he was a legal right to take his dog anywhere, and when someone challenges that, he gets upset." Service dogs are trained to work with children and families living with autism for increased safety and socialization. In B.C., someone with a disability accompanied by a certified guide dog has the same rights and responsibilities as someone without, according to the Ministry of Justice. Cotognini said she plans to file a complaint with B.C. 's justice minister in hopes that whale-watching companies will be educated about the rules around service dogs in the province. "We couldn't find any policy on any of those [company] websites about about dogs," she said. "It's ridiculous. At the very least, you should have proper policies in place." On Tuesday, Cotognini said the owner with Eagle Wing in Victoria emailed her to apologize for turning the family away, saying that an inexperienced employee "wasn't versed" in how to handle service dog requests. The owner offered to take the Cotogninis on a tour in the future, but the family had already left the city. HuffPost B.C. has reached out to Steveston Seabreeze Adventure for comment.